2.5L(2458cc / EJ25) SOHC H4 16V "EJ25" VIN "B". 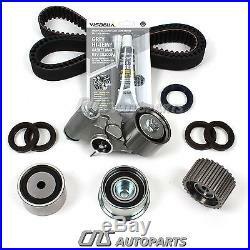 New OEM Grade "HNBR" Timing Belt Kit & Water Pump Set. 06 - 09 SUBARU LEGACY 2.5L SOHC H4 16V NON-TURBO Eng. 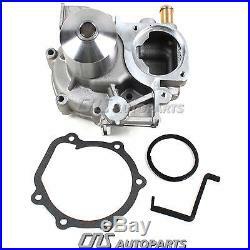 06 - 09 SUBARU OUTBACK 2.5L SOHC H4 16V NON-TURBO Eng. Code "EJ253" VIN Code "B". (Fits Outback with VIN "B" ONLY - 4th digit/does not fit Outback with VIN"G"). 1 OEM Grade "HNBR" Timing Belt (223 teeth) for USA Built engines. 1 Tensioner (tensioner & hydraulic cylinder combo). 1 Lower Idler (sprocket with bearing). 2 Upper Idlers 2 req. 1 left & 1 right. 4 Camshaft Oil Seals (32 x 45 x 8). 1 Crankshaft Oil Seal (33 x 49 x 8). 1 Water Pump (1 Outlet Tube Type), Gasket, Seal. This listing is for "SOHC, NON-TURBO" models with vin codes "B" (4th digit). The original Subaru right idler bearing may have an inner flange on it. The idler bearing in this kit does not. This replacement idler fits & performs fine. 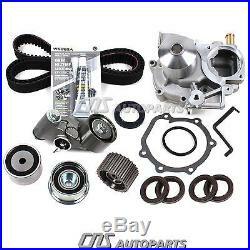 The item "Timing Belt Water Pump Kit Fit 06-09 Subaru Legacy Outback 2.5 EJ253 SOHC" is in sale since Friday, December 30, 2016. This item is in the category "eBay Motors\Parts & Accessories\Car & Truck Parts\Engines & Components\Timing Components".